A few weeks ago on Hotel Paral.lel (the sequel to Post-script on Album 88), there was a song that, quite honestly, blew me away. I sat there on my couch, a book open in my lap, and just listened to the song. Waves of guitar crashed against each other and smashed up against a deep bass riff and some cymbal-heavy drumming. The vocals were a slow moan, and something about the tone of them and the way it combined with the guitar riffage really reminded me of Hum. You might remember Hum as a mid-90s alterna-rock act that had the minor hit Stars (recycled a few years back in a Cadillac commercial, of all things). I was a big fan, and, as i listened to this new tune, i was excited to learn that someone had carried on the Hum trend. Who was this act? Well, at the end of the half-hour set, the DJ announced that the song was Losing Streak from Jesu's latest EP, Opiate Sun. That surprised me somewhat. You see, Jesu is a band that has been circling the type of music that i listen to for a years. They are circling the shoegaze scene like a shark or other predator, hoping for a sign of weakness. At least, that is my impression. 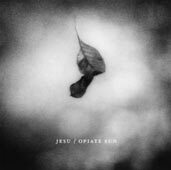 You see, Jesu is the current project of Justin Broadrick, who was the driving force behind both Napalm Death and Godflesh. Those two acts were too heavy, too aggressive for me to enjoy fully. I assumed that Jesu was more of the same, so despite favorable mentions from people i otherwise trust, i avoided the band. But, well, wow. I was wrong. I sought out this EP, and have listened to it continuously since then. Jesu are not an aggressive industrial/metal act. They are a melodic heavy shoegaze band, similar to acts such as SIANspheric, A Place to Bury Strangers, and Spaceman 3. The only difference is that there is less of a psychedelic element in Jesu than there seems to be in those bands. There is 25 minutes worth of music on the Opiate Sun, split up among four songs. The first is Losing Streak, which was my entry into the band, and is a stunningly good tune. Opiate Sun is next, and it is very similar to Losing Streak. The guitars move in a similar fashion, and the voice is even similar. Call it Losing Streak part B and move on, although i must add that at thirteen minutes between the two songs, i do not get weary of this sound, so Jesu must be doing something right. Jesu mix it up a bit on the third track, Deflated. This song starts with some heavy power cording, and then gets melodic for the choruses, one guitar line chugging along and another chiming, under a voice that reminds me of Bob Mould on the first Sugar record. This is a slow song, meandering and sludgy, but it really works. Finally we have Morning Light, which is, if anything, even slower than Deflated. The guitars grind through the song, and the drumming is ponderous and loud. The voice sings long notes, gasping for breath audibly between each world. However, the bridge features an amazing bit of guitar interplay, as things chug and echo and tinkle along all at the same time. This song is almost exactly what a heavy industrial guitar act playing shoegaze should sound like, i now realize. So, let's just say that i am impressed. This is a damned fine EP, and it seems to be over before i have even noticed that it has begun. These songs are loud, and it is perfect music to head bang along to in the car. So my message to you fellow shoegazers is, don’t be scared of Jesu because of their lineage. This is very worthwhile stuff.